COTTONWOOD – Community gardens in the area will get a jump-start on the growing season this year, thanks to a program at North Idaho Correctional Institution here that trains inmates in horticulture and greenhouse management. The program, now in its fifth year, is certified through Lewis-Clark State College and provides inmates an eight- to 10-week course in which they learn to nurture seeds, manage a greenhouse environment and prepare seedling plants for distribution – free of charge – to community gardens and other nonprofit organizations. “We’re teaching ornamental horticulture, which is a series of seven competency sections that were developed at the College of Southern Idaho and LCSC adopted,” said Bill Farmer, who oversees the education program at the prison. Once a week Stefenie Brimacomb, a teacher at Kamiah High School, comes to the prison to instruct the inmates on 30 hours of the course curriculum. In addition, inmates spend about 30 hours watching videos on computers about plant management and other horticulture topics, and another 30 hours doing hands-on tasks in the greenhouse. The 30-foot-by-48-foot professional quality greenhouse was purchased for about $48,000 from a fund that had been intended for use at one of the southern Idaho prisons, but was not able to be utilized. Farmer said he was advised to buy the best quality greenhouse he could afford, and he’s never regretted the decision. The spacious nursery – oddly juxtapositioned among a compound of tall, razor-wire-topped chain-link fences – houses rows of raised beds constructed by inmates and several seed-potting zones. A vermiculture case contains a nucleus of earthworms that will be used to break down organic material into compost blended with soil amendments and mulch during the growing season. And for the past three or four years, huge boxes of seeds from an anonymous nursery in southern Idaho “miraculously” appear, Farmer said, supplying the program with all the vegetable and flower seeds – and more – that it needs to continue the work. Farmer suspects that a mother of a former inmate initiated the donation of seeds. Although the snow this winter reached to the top of the sidewalls of the greenhouse, Farmer said the inside of the greenhouse remained nice and cozy. Most Idaho Department of Correction prisons have some type of gardening program, said Jeffrey F. Ray, public information officer for the department. In a few weeks, inmates at the South Idaho Correctional Institution at Boise will begin the facility’s ninth year of growing fresh produce for the Idaho Foodbank. Inmates at South Boise Women’s Correctional Center and Idaho State Correctional Center near Kuna grow sagebrush seedlings each year to help restore sage grouse habitat. Last year, the Sagebrush in Prisons project produced almost 60,000 sagebrush and bitterbrush seedlings for habitat restoration, which is a cooperative program between the department of corrections, the Bureau of Land Management and the Institute for Applied Ecology. Inmates at the women’s institution grew and helped plant 25,000 sagebrush bushes in recently burned areas. Crew members attended lectures about Great Basin ecology and received certificates documenting their participation and achievements. Inmates at the women’s center also have developed a high desert garden that includes several raised beds and a water feature surrounded by landscaping. The project helps inmates learn about sustainable living. 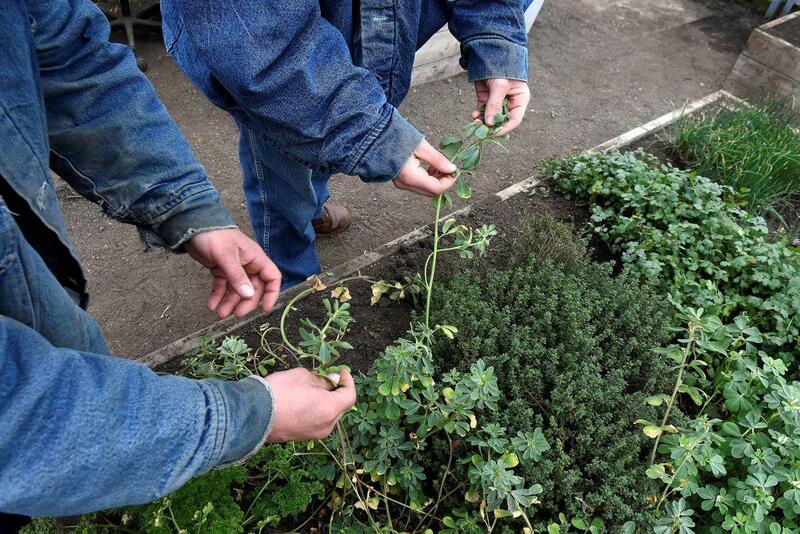 The Idaho Correctional Institution at Orofino has created a popular gardening program that provides fresh produce that supplements the diet of the nearly 570 minimum, medium and protective custody inmates there and at Cottonwood. Farmer said programs such as the NICI greenhouse project give inmates valuable work skills that help prepare them for a better future once they’re out of prison. “What are they going to do when they get out?” he said. “Definitely having activities, whether it’s gardening or working in the greenhouse, that has a purpose and these guys have a sense of that. Finding useful activities to help inmates learn skills that can benefit them outside of prison is a challenge for the correctional system, Farmer admits. Some of the inmates currently in their third week of the horticulture course have had a bit of past experience in gardening. Because of department of correction guidelines, only the first names of inmates could be used in this story. Christian, one of the inmates involved in the program, said he has worked in landscaping in the past but much of what he is learning in the greenhouse program is new. Scott, an inmate who is enthusiastic about the science of soils and the proper way to plant seeds, said he used to work planting trees and shrubs but ornamental and vegetable gardening is new to him. He is especially complimentary of Brimacomb for the information she has passed along to inmates. And Corey, who’s never been around a greenhouse environment, senses that the benefits reach far beyond the practical application of a classroom project. Out of every 100 inmates at NICI, Farmer said, all but about 15 eventually will be released on probation. Of those 85, about 70 will remain out of the prison system indefinitely, according to national statistics for the 180-day rider program. Nationally about 64 to 66 percent of rider inmates never return to prison. “You’ve got to have programs like this in order to make the substance abuse treatment and the education and those other things flourish,” Farmer said. Published: March 31, 2019, 4:51 p.m.